Sometimes the best new ideas are actually old ones. 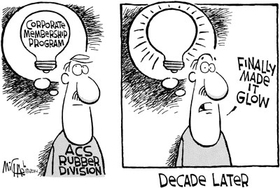 Such is the case with the ACS Rubber Division's Corporate Membership program, which was approved before last fall's International Elastomer Conference and Rubber Expo. It was rolled out slowly and then gained momentum when the group started marketing it heavily early this year. This “new idea” had been tossed around for the last decade within Rubber Division circles, but because of various circumstances, it never went further. Normally such initiatives need someone to take responsibility for it—”ownership” in today's business speak—and make it their mission to push it forward. In this case, that person was Leonard Thomas, who served as Rubber Division chairman during 2013. He put the Corporate Membership idea on the front burner in 2102 and made it one of the top goals of his year as chairman to get the process underway. He knew that the Rubber Division, not unlike other industry groups and associations, had struggled in recent years to retain members, let alone attract new ones. In this era of consolidation where money is tight and everyone is busy—barely having time to do their jobs let alone pursue outside activities—it is difficult to convince organizations to accept such expenditures. Thomas, though, knows what business leaders respond to: value. When the four-tier, corporate membership pricing structures are laid out before them, it's easy for leaders to see the worth to their businesses. Information gleaned from joining the Rubber Division, such as onsite classroom instruction that is available to member firms, can help companies do their business more efficiently, and that in turn benefits their employees and the customers they serve. The response has been encouraging. A total of 30 companies covering about 375 employees already have signed on. The Rubber Division was careful in putting together the packages not to undercut what the Akron-based technical organization already offers through its various departments. But it's clear the program has resulted in great outreach for the Rubber Division. Companies in Malaysia and Australia have inquired about the program, bringing about more international exposure. Not bad for a new idea that's a decade old.